for molecule formation are not well understood. 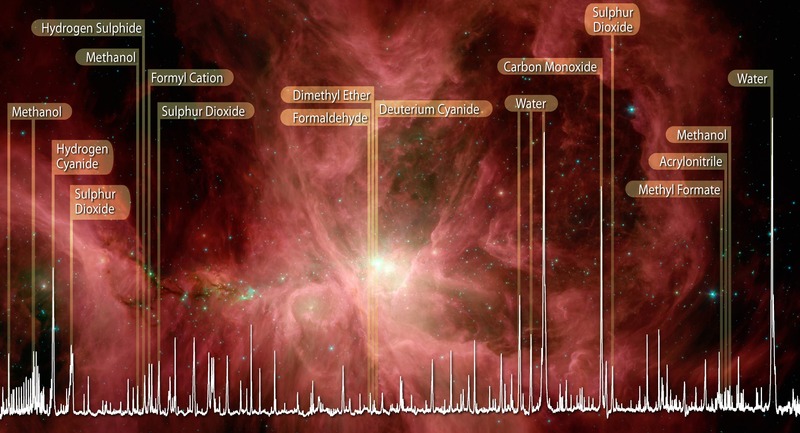 A characteristic feature of the Orion spectrum is the spectral richness: among the molecules that can be identified in this spectrum are water, carbon monoxide, formaldehyde, methanol, dimethyl ether, hydrogen cyanide, sulfur oxide, sulfur dioxide and their isotope analogues. It is expected that new organic molecules will also be identified. The spectrum was obtained only one month after HIFI resumed operations on-board Herschel. In August 2009, HIFI experienced an unexpected voltage spike in the electronic system, probably caused by a high-energy cosmic particle, resulting in the instrument shutting down. HIFI, a high resolution spectrometer was designed and built by a nationally-funded consortium led by SRON Netherlands Institute for Space Research. HIFI senses radiation in seven wavelength bands. NASA provided the mixers and local oscillator chains for the three highest bands, local oscillator components for four other bands, and power amplifiers. The enormous improvement in sensitivity and frequency coverage afforded by HIFI is a result of intense technology development at JPL supported by NASA over more than a decade. An innovative approach to providing the broad frequency coverage was developed using devices for frequency multiplication fabricated at JPL in conjunction with industry-developed amplifiers. The detectors and readout electronics used in Herschel's SPIRE instrument were also developed and fabricated at JPL.